"In a world dominated by abstract art and the New York Art Mafia comes the story of a boy who wants to paint reality, outside, sanding in the mud, facing into the burning sun and brave biting flies like a man. His loyalty for his Russian master is put to the test when he is forced to choose between forbidden teenage love and the purity of learning to paint like a God of nature." Here is a PA from the last paint out I was in. 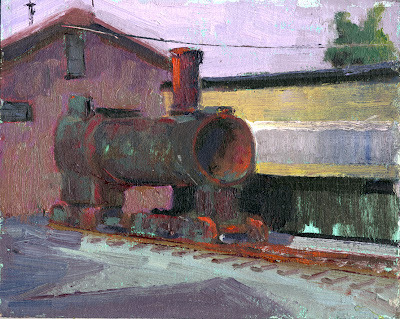 This one was painted the train museum in Jamestown. This old train was used in TV shows like Petticoat Junction and movies like The Unforgiven. 8x10 oil on linen. Come out and see and paint. Try and find me. great blog and have a good week in Slo! Saw your post on wet canvas and glad i came to visit. My eyes are very happy to pass by this blog. That's a really cool, dirty-looking loco. See you there! The weather forecast looks great. Remember last year's rain? At least it made for some very dramatic skys. Cheers! When I first visited your studio with Bob (20 some odd years ago!) I was impressed with the oil portrait studies you had done (they might've been nudes from the Art Students League)--it's very exciting to see you following your dream to paint; it's even more exciting to see how visceral and confident your application of pigment has become. Keep it up. By the way, I'm partial to the "W" sig, but, I hear a full signature was recommended? Man, I really love your paintings. the unusual things you're painting. You're definitely one of my favorite painters! Robin-- thanks for coming by I like your Water colors. You have a unique style. Thanks Fabio-- your cartoon style keeps getting more polished. Have fun at Slo! I can't wait to see what you come back with; no doubt you will find beauty in unexpected places. Looking forward to seeing what you bring back. I just heard that you are gong to be the next demo. 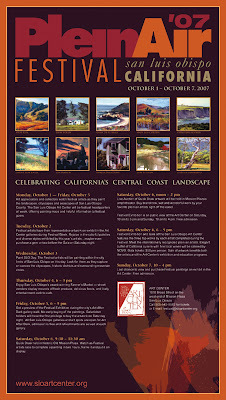 artist at the Orange Art Associations next meeting in Nov. I am REALLY looking forward to meeting you and seeing the demo! Will you be selling copies of your book at the meeting? Just wondering if I should buy it now or wait. Your work is amazing! Hey Ed It was great to see you . Hey Jeff, It's been years. Your cartooning is better than ever. thanks Marko-- Your a heck of a cartoonist yourself.